Although the Seymour Marine Discovery Center is smaller than the Monterey Bay Aquarium, it is loaded with marine life, history and geology. The focus here is education and conservation. Outside, you can't miss the 87 foot long skeleton of a blue whale, called Ms. Blue. She died in 1979, washed ashore north of Santa Cruz near Pescadero and her skeleton was assembled in 1985. This is one of the largest skeletons of any kind displayed anywhere in the world. 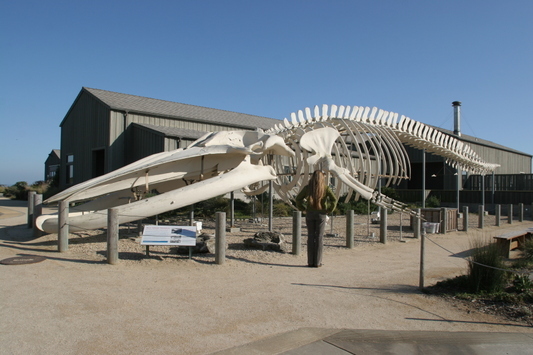 She is only one of four blue whales skeletons on display in North America, and she may be the largest one displayed in the world! Inside, the aquarium is a very interesting place to visit. 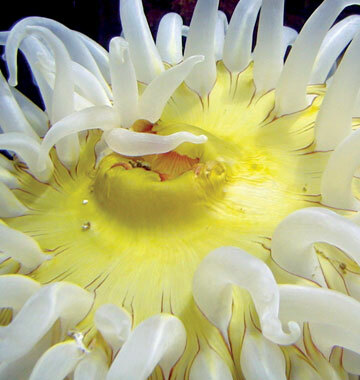 The tanks are home to rockfish, jellies, decorator crabs and eels. You can touch a friendly swell shark in the shark pool or sea anemones, hermit crabs, sea urchins, sea stars and more in the invertebrate pool. In the Exhibit Hall the Seymour Marine Discovery Center takes you beyond where most aquariums take you. Learn more about scientific research in our oceans, learn about the hearing of harbor seals and sea lions, understand the role of sea otters in their ecosystem, observe the differences in animal and plant life in different tidepools and learn about elephant seal behavior. Family tours, daily tours, group tours, behind-the-scenes tours, family events, field trips, summer camps and on-going education are all available here. Call 831-459-3800 for more info. Tuesday - Saturday 10am to 5pm. Open every Monday in July and August from 10am to 5pm. Community Free Fridays (open free to the community) on select Fridays throughout the year. Call 831-459-3800 for more info. The Seymour Marine Discovery Center qualifies as an attraction for the GoCard. It's a sightseeing pass that saves you money on multiple attractions, so if you're planning on seeing more than this aquarium, it might be worth your time to check it out here. Or find a cheap flight using this handy dandy flight finder. Just type in the "to" and "from" fields and tripadvisor will scan through 100s of booking sites across the net to find the best deals possible. Its fast and easy! The closest hotel to the aquarium is listed first. I have not personally stayed at any of these hotels, so please click on each one to read the reviews before booking your trip.